Nikah khawan in Lahore Pakistan is such a person who conducts a nikah ceremony religiously and nikah registrar in Lahore Pakistan is such a person who registers the nikahnama in Lahore Pakistan. 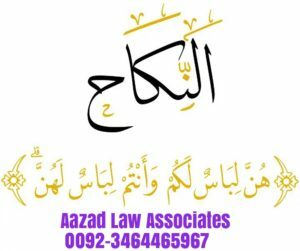 Aazad Law Associates is the top law firm of Lahore dealing in family cases and nikah khawan service in Lahore Pakistan is a part of it. 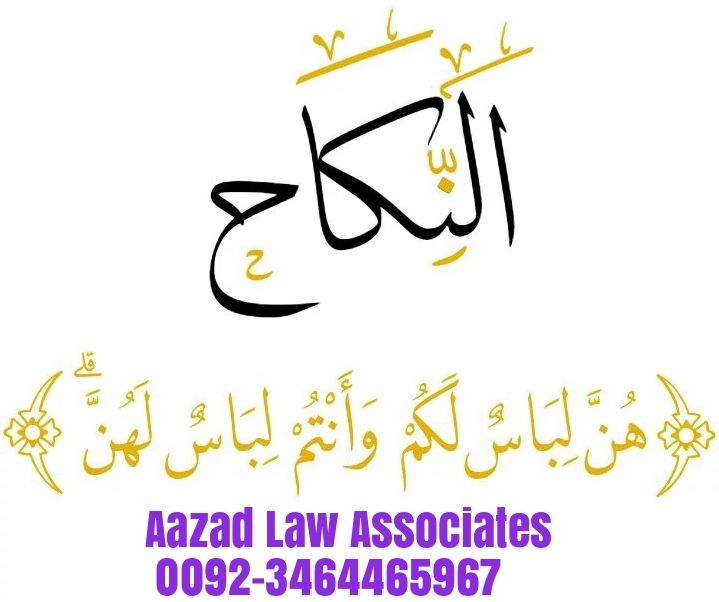 Aazad Law Associates have a panel of registered nikah khawan in Lahore and we also have panel of registered nikah registrar in Lahore Pakistan. People find online nikah khawan in Lahore Pakistan through us as we provide the best services of online nikah khawan in Lahore Pakistan. Most of the people don’t have any idea that like for every work the government had made laws and now the laws are also made for the services of nikah khawan in Lahore and all over the Pakistan. Only a registered nikah khawan in Lahore Pakistan can provide his services. Services of an unauthorized person as a nikah khawan in Lahore and other cities are a crime now. If any unauthorized nikah khawan if conducts a nikah will be punished with imprisonment up to 6 months along with others who had hired his services. The government of Punjab ensures that only registered nikah khawan in Lahore Pakistan and other cities provides the services. The government had made policies through which it is made sure that no unauthorized person would conduct the nikah. For example in nikahnama the nikah khawan signs the marriage certificate and when he submits it before the nikah registrar in Lahore pakistan he tenders a copy of his license and the signatures are double checked by the registrar. The Nikah registrar also take the signature of nikah khawan at his record book where he mentions the names of the parties. In short rules exist where it is checked whether the nikah khawan in Lahore Pakistan who conduct the marriage ceremony was authorized for that or not. Let us also inform you that non registration of nikahnama is also a crime in Pakistan punished with 6 months of jail. Those who think that it is fine to do nikah orally for them the news is that the government and law both do not recognize such type of nikah and consequently an FIR of Zina can also be lodge against such couple. A Qazi nikah khawan in Lahore Pakistan needs to be registered and must have a valid license. In the past people of Lahore used to call the nikah khawan in Lahore Pakistan from anywhere and they conducts nikah. Sometimes any close relative who conducts the nikah which is also a crime because he was not authorized for that. Only a qazi nikah khawan in Lahore holding a valid license can conduct the nikah services in Lahore Pakistan. Perform nikah is a requirement by sharia where as registration of nikah is the requirement of law so a person registering the nikahnama should be well acquainted with the law. All our nikahnama is registered under the supervision of our law firm so that if there is any legal lacuna we could fill it. A nikah registrar in Lahore Pakistan should also have a valid license to register the nikahnama in Lahore. When a computerized nikahnama is issued the cnic number of the nikah registrar is also mentioned in it. Please contact our law firm if you are looking for a nikah khawan in Lahore Pakistan as we also have nikah registrar in Lahore Pakistan available. Services of online nikah khawan in Lahore Pakistan are also available.